Bed bugs continue to make headlines across the United States. Reports show that infestations are substantially increasing in busy cities and popular travel destinations such as New York City. Ensure that you have the facts to protect yourself from this commonly encountered pest. Myth: Anyone can effectively control a bed bug infestation on their own with DIY (Do It Yourself) measures and over the counter pesticides. Fact: Bed bugs were once again name the most difficult pest to control by the National Pest Management Association in their 2015 Bugs Without Borders Report. While heat is a commonly used treatment method, it does pose dangerous for someone untrained attempting to do it themselves. Fire is a common result of a bed bug treatment gone wrong. Alternatively, treatment by chemical approaches are conflicted by the fact that U.S. bed bugs have developed resistance to some of the most widely used insecticides. Therefore, a pest professional should be consulted to make an educated decision on which treatment methods and products are most effective and properly formulated to eliminate bed bugs. It is highly recommended that anyone with an infestation work closely with an experienced and knowledgeable pest professional to effectively remedy the situation. 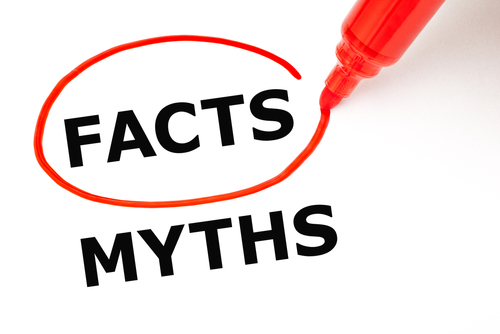 Myth: Bed bugs really aren’t that prevalent in hotels, especially those offering more expensive rooms. Fact: Bed bugs are on the rise! A recent report conducted by Bed Bug Registry shows a 44% increase in bed bug incidents at New York City hotels from January 2016 over January 2015, even at five-star hotels. Bed Bug Registry is a public database where travelers can report bed bug incidents. One of the biggest misconceptions about the pest is that they only frequent low-income environments. Quite the contrary; BED BUGS DO NOT DISCRIMINATE! These skilled hitchhikers can be dropped off at a roadside motel just as easily as a luxury resort. Myth: Using the luggage rack in a hotel room will prevent your clothing and luggage from being infested. Fact: Luggage racks are typically covered in fabric with plenty of places for an insect as small and thin as a bed bug to hide. Consider instead placing your luggage on a hard surface during your stay to avoid infestation. Experts recommend placing your belongings into the bathtub when you first arrive in a hotel. Ensure that before you use the luggage rack you first fully examine it with a flashlight for signs of bed bugs. Most importantly, wash and dry all of your clothing on the highest temperature that the fabric will allow when you return home. Never store your luggage near your sleeping area, rather a basement or attic is preferred. When seeking out information about bed bugs ensure that you are tapping into a legitimate site such as a reputable pest control company, state university or national association like the National Pest Management Association. We will continue to debunk bed bug myths and encourage you to send in questions about bed bugs to: info@allergytechnologies.com.